This is a shot of the Zelda 64 demo that Nintendo showed off while it was gearing up to release the Ultra 64 (which became the Nintendo 64 before it hit store shelves). 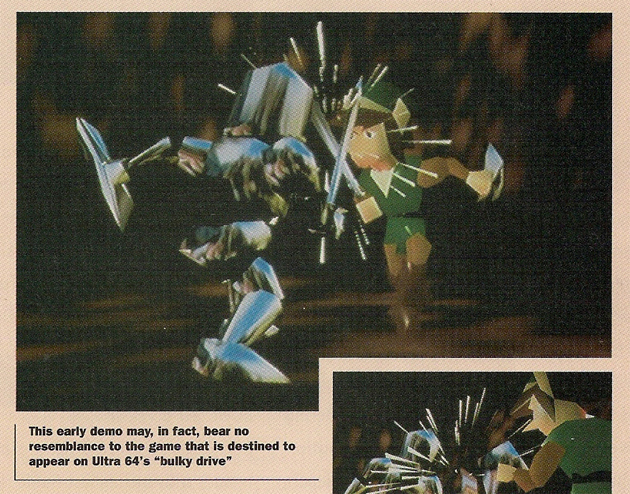 This screencap comes from the February of 1996 issue of Next Generation magazine, so the general public wouldn’t get its hands on the actual game for over two and a half more years. It was a radically different game at that point. It was initially supposed to be a launch title for the 64DD (or “Bulky Drive”), a compact disc add-on to the N64 (think Nintendo’s answer to the Sega CD) that never launched outside of Japan. In fact, at one point, Nintendo even played around with the idea of making this a first-person game. Thankfully, common sense prevailed, and the Ocarina of Time version we all know and love came into being without requiring the purchase of a pricey add-on. The game’s $59.95 price tag was brutal enough, especially considering this was 1998. 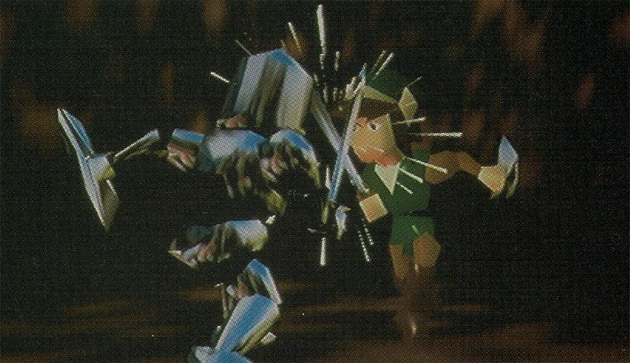 Now, obviously, Nintendo wasn’t planning on releasing a game that looked like this terrifying screenshot. Even the Next Generation image caption was hilariously skeptical. Even so, perhaps there’s an alternate universe somewhere where the above game was what the final version of Zelda 64 for the 64DD looked like. Thankfully, that’s not the universe we live in. Update: I managed to find an actual FuncoLand game ad, which lists Ocarina of Time‘s launch price at $59.95. I haven’t yet been able to verify that this is the actual MSRP, but it looks like I was probably mis-remembering the $80 launch price. The article has been amended to reflect the lower, verified price. N64 games were THAT expensive!? DAMN! Kinda glad I didn’t start gaming during that era. Reckon PS1 games were cheaper by a wide margin. Wonder if Nintendo regretted that having stuck with cartridge at that time. Guess we’ll never know if Nintendo has any regrets at all, even back from when they started or the 90’s themselves. Yes, Ocarina was $80 at launch. That’s insane, right? I don’t remember what any of the other N64 games cost at launch, though. If I remember correctly, PSOne games typically cost about $50, and I think the green-label PlayStation Classics were $20. That’s off the top of my head though, so I wouldn’t quote it as the gospel truth or anything. Yeah it’s a miracle the game even broke 7 million. And ok, it sounds close to what it’d be though since PS1 games were cheaper to make after all. Wonder how Nintendo marketed the game to prove the price was justified unless of course all they needed was the name Zelda to sell it on the spot. Be nice if games could go back to being $50 like during 6th gen. Don’t wanna price hike past $60. Wonder if next gen Nintendo will make their console so powerful that games are uber expensive like during N64 era. I think if the games had been cheaper it would have won 5th gen instead of PS1 as the former was more inexpensive to buy than the latter. Looks like I was remembering the $80 launch price wrong. I found a Funcoland ad that shows a launch price of $59.95, so I’ve updated the article. But I also dug up a bunch of N64 MSRPs that were $65-80, so I wrote up a new piece about it, if you’re interested. So it ranged at different prices at launch then? And ok, looking forward to it.